The Materials Research Facilities Network (MRFN) is a nationwide partnership of NSF supported MRSEC centers designed to provide support to researchers in the broad area of materials research in academic, government, and industrial laboratories. The overall goal of the MRFN is to function as a national network that supports and promotes the growth of the materials science field in the United States, as well as increase its ability to compete internationally. Each center addresses the growing need for advanced fabrication, characterization, and computational tools from both academic (large and small colleges) and industrial scientists in materials research. By providing researchers with unprecedented access to instruments, techniques, and collaborators the network enhances the investigation of theory, synthesis, and characterization of materials by integrating the capabilities of individual MRSEC centers into a cooperating network. 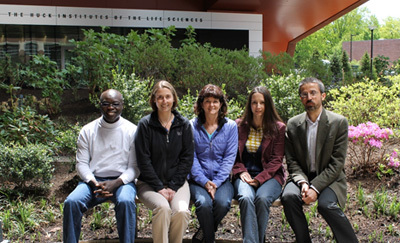 At Penn State, the MRSEC has partnered with the Materials Research Institute to establish the MRFN Faculty Fellowship Program. This program targets the establishment of relationships between Penn State and faculty from Primarily Undergraduate Institutions who are engaged in an existing research effort. The fellowship stives to bolster the research effort by providing the resources necessary to utilize MRFN facilities on the University Park campus. Awards are in the range of $5,000 and can be used to cover instrument usage and staff time charges. Demonstration of complementary support is encouraged, e.g., student funding to work on the project. MRFN facilities at Penn State include the 2-D Crystal Consortium, Nanofabrication Laboratory, Materials Characterization Laboratory, and the Materials Computation Center. All questions and proposal submissions (via email attachment) should be directed to Josh Stapleton jjs366@psu.edu Proposals are due by 5:00 pm on March 18, 2016.